Thomas Kretschmann, left, and Song Kang-ho in South Korean film A Taxi Driver. A Taxi Driver is the closing film of the 2017 edition of the Fantasia International Film Festival. It’s a dramatization of chilling, real-life events from South Korea’s tumultuous history. In May of 1980, Jurgen Hinzpeter, a German reporter, stationed in Tokyo, hears rumours about government violence against citizens in Gwangju South Korea. News is not getting out because phone lines have been cut and roads into and out of the city are blocked. The country is under martial law; many schools are closed and news reports are censored. 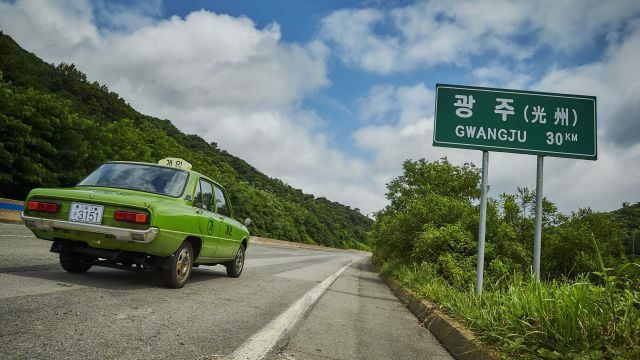 Hinzpeter (played by Thomas Kretschmann) flies to Seoul and hires a taxi driver named Mr. Kim (Song Kang-ho) to drive the 300 km to Gwangju. (In those days, the city’s named was rendered as Kwangju in English.) With advice form local farmers, the two men manage to bypass the barricades and enter the city using tiny back roads. Once in the city they see a real spirit of solidarity among the citizens, who are hungry for democracy and an end to military rule. Then they see soldiers shooting the protestors, young and old, along with people who try to help the wounded. They capture these events on film while trying to avoid arrest, injuries or their own deaths. The film’s only screening, today, Wednesday, Aug. 2, 2017, is sold out, but if you are among the lucky people who have a ticket, here are some links to recent articles and ones written at the time, that will give you some background information to the events depicted in the film. Gwangju is about 300 km from Seoul. These days, one can drive there in about 3 hours and 15 minutes. Shorrock’s article contains links to many, many others. A Taxi Driver is distributed by Well Go USA. Perhaps it will return to Montreal for a general run in the future. Previous Post See Colossal again, or for the first time, free, outdoors, at the Fantasia Film Festival, tonight!